Dimensional flowers attached add flavor and grace to this Cinderella Couture dress. Elegant boat neck cap sleeve dress in ivory, high and low overlaid style and super puffy. Decorated in 3D flowers and soft tulle. 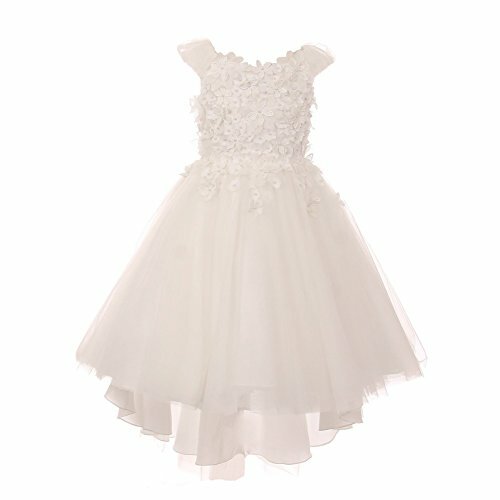 Great for flower girl, junior bridesmaid, graduation, Easter, spring, pageant and special occasion. Tea Length dress with zipper back entry. Boat neck, high-low skirt, hard net for maximum puffiness, super soft tulle, 3D flower embellished lace with hand beaded pearls are features that make the dress distinctive. Hanging cover bag included. Suitable for little girls.